Connor’s family is running away from his father’s shady past, starting a new life in a so-small-it’s-barely-even-on-a-map town, in an old house they bought for cheap—with attic windows that look like eyes. The house feels off from the moment they step inside. Ten years later, Gwen’s family is running away from her troubled past of mental breakdowns and the ostracizing among her high school peers and everyone else that comes with that, and starting a new life in the same barely-on-the-map town, in the same rickety, ominous, suspiciously-affordable house with attic window eyes and an extremely uninviting presence, even amidst it’s idyllic location in the woods by the river. 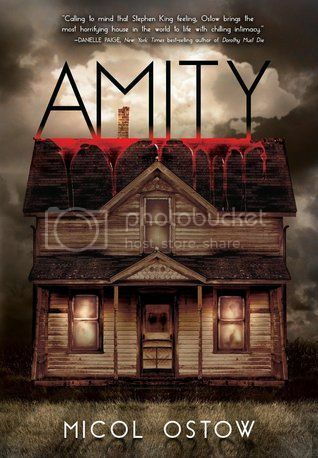 The house’s long, dark history slowly reveals itself in dreams and visions of shotguns and brutality and tragedy and horrors to both Connor and Gwen, in dual narratives that lurch forward on parallel tracks, even though they’re separated by a decade—because in some places, like Amity, history is not only alive…it’s coming to get you.